Review: I remember that summer when the very first Jak and Daxter was showcased at the E3 expo in June 2001. I remember reading about it in a newspaper, highlighted as one of the games that grew out of the second wave of PlayStation 2 releases. 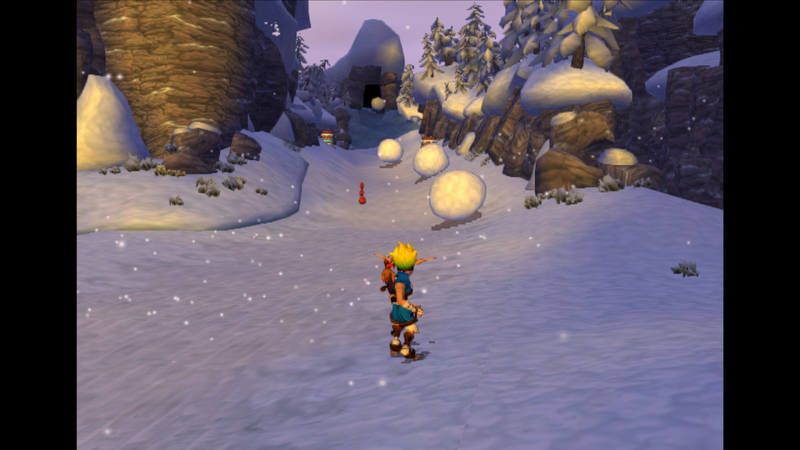 Games built on more experienced software development for the PS2's complicated architecture. Finally developers began to become familiar with the hardware and left the bland launch line-up behind. From here on, the big PS2 titles just started rolling in. 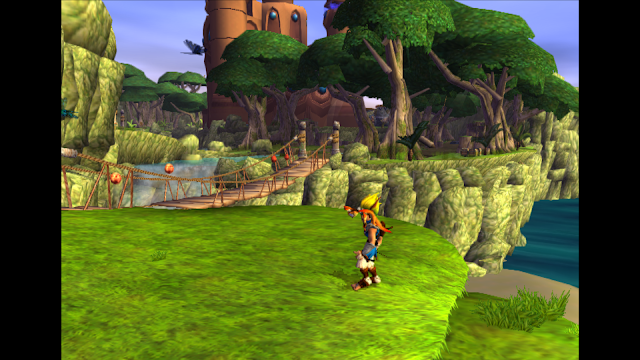 J&D was one of the first truly spectacular titles for the system. Developed by the people behind the successful Crash Bandicoot series on PS1, they had a legacy of platformers behind them and were finally going to give Super Mario 64 a worthy 3D platformer competitor for a new generation of consoles. Sure, we'd had Crash trying his best on the limited 3D power of the PS1, thus being more 2D than 3D. 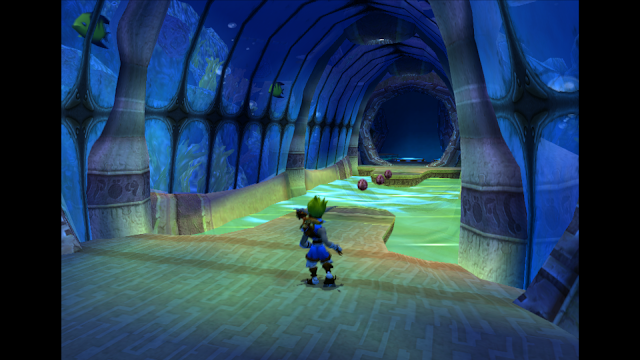 Spyro the Dragon had attempted even more so, Sega Dreamcast's Sonic Adventure had kickstarted it on this new generation and Rare had done their share of 3D platformers on the N64, but still Super Mario 64 managed to be the perfect blueprint. For me, it's legacy and first time playthrough amazement has never really been surpassed and truly testifies how perfect and revolutionary SM64 was, but we're not here to speak about that game now. However, it has to be mentioned as a backdrop as there have been a couple of titles outside of Nintendo's own that have given SM64 a run for it's money and J&D is one of these. Perhaps the best attempt too. J&D truly nails a colourful, cartoony and a Pixar-like artstyle, combined with lots of humour, to make a unique style of it's own. Artistically it works perfectly for the platformer genre and PS2 finally delivered the hardware needed to make that Pixar influence even more possible. 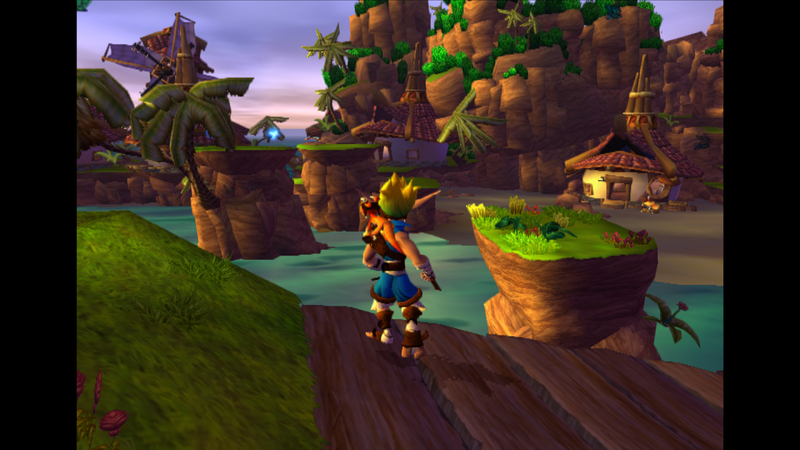 Gone are the strict limitations of PS1 hardware for large 3D worlds and J&D utilises this to the fullest. The worlds and levels are huge, with an incredible draw distance for it's time. Distant enemies, platforms, machinery and puzzles can be seen for miles. 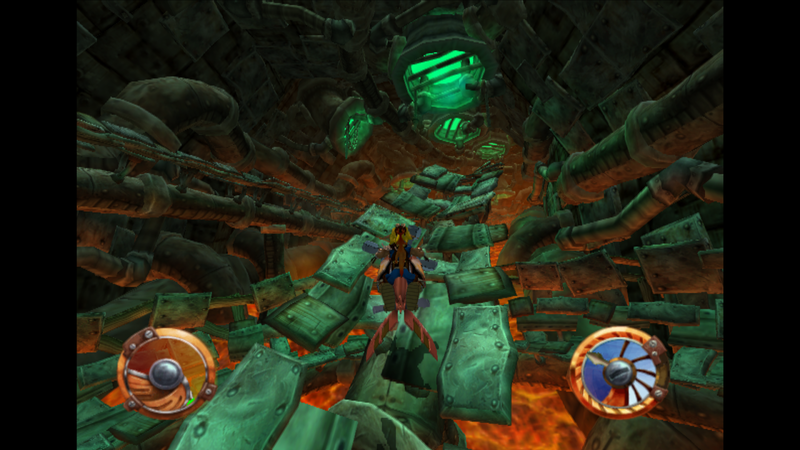 The open ended structure of the game allows the player to just run towards what he or she wants to explore next. I recall walking down to the beach the very first time I played it back in the early 2000's and just seeing tons of stuff I wanted to do far into the distance. I was really impressed back then by the rich visuals and beautiful artstyle. There's obviously a linearity to the levels being connected, but there's always an option to walk back and collect more stuff you missed the first time around. J&D cleverly connects it's large areas by hiding loading and transitions with lifts, hoverbike rides or small paths leading from one visual styled area to the next. In fact, you can play the whole game without experiencing loading screens at all, it's an impressive feature for such and old game. I love the variety of the worlds you discover too; sandy beaches by the sea, snow covered mountains, an underwater city and a boiling, orange clad lava area. Each environment is truly memorable and bring out how diverse this game engine was. Having recently gone back to the game I was also was reminded that the game has a day and night cycle! It gives every level a chance to show itself in bright light, yellow sunsets and dark moonlit nights; just a treat when it comes to incredible lighting at the time it released. Very few games did realtime lighting at all when this game launched and to think it was combined so well, it makes the game world even more immersive when playing! J&D plays incredibly well too, even today I had no problem controlling the game. It's fast, precise and fun. While I got frustrated at some of the grabbing mechanics, it feels unprecise and results in unfair and cheap deaths, the rest of the control system is great. It's kind of the ultimate test of time if the game holds up or not; does the game still control in a fashion that doesn't annoy or limit the player from performing the tasks needed or having fun. J&D controls just as well as modern platformers, it's joy to traverse the landscape. The balance between platforming and enemies is perfect too, unlike Ratchet &Clank overuse of enemy encounters, J&D relies much more on it's platform side. After all, that's what a platformer is about. While the return to this PS2 classic release was a warm and welcome one, the PS4 port has it's issues. The most obvious is bad performance occurring frequently, we're talking lots of framerate drops. 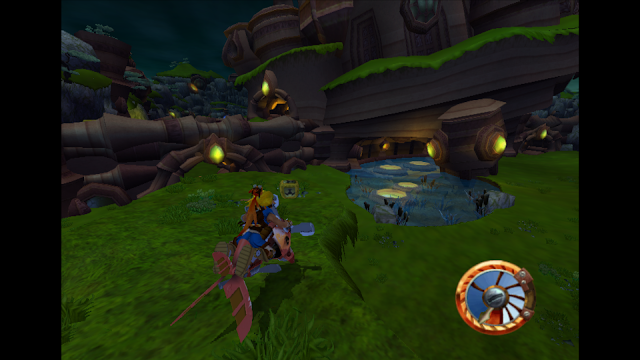 Sometimes they are so severe they actually hamper the gameplay, crowded scenes with lots of effects sets the player out of pace and makes controlling Jak a pain until it settles. It's sad to not see this fixed and a missed chance for a version that could easily run at a locked 60fps on such powerful hardware. The other letdown is the low resolution bump over the PS2 game, putting this at a measly 1024*768 resolution. While it's a clear visual boost from running the game with a PS2 on a HDTV, I would have liked a stronger visual boost to such an old game. It should easily have been a 1080p@60fps game. J&D still stands as one of the best 3D platformers made in my opinion, between the groundbreaking and excellent Super Mario 64 and this game, nothing truly has engaged me as much in the 3D platform genre until perhaps Nintendo's own Mario games of recent years. While it may be visually dated for new and young gamers, it's still an experience I would recommend. Especially gamers from the 90's that missed it's initial launch should check this out. 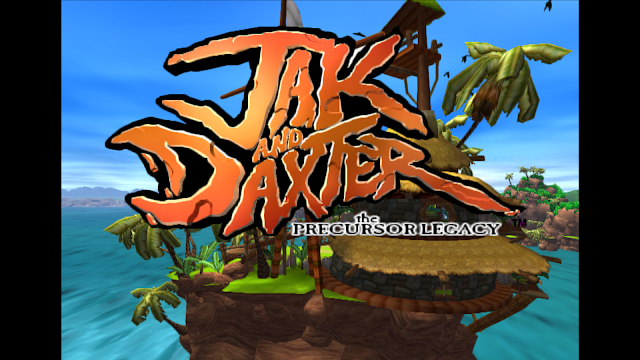 The gameplay and exploring is addictive and fun, it truly is one of the PS2's finest moments and should be remembered as such!